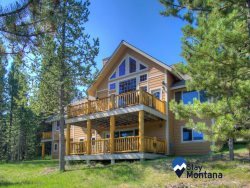 The Fly Fishing House is your quintessential Montana fly fishing escape! Located 2.5 miles north of Big Sky on the banks of the famed Gallatin River, this three-bedroom and three-bath home is calling all fishermen. After a long day of fishing, just kick back in the hot tub or the large deck and relax to the sounds of the Gallatin River. The home is only three miles away from Big Sky Town Center that offers numerous shops, restaurants, free concerts in the park, movie theaters, farmers market and much more. Continue on a short drive to Big Sky Resort for shopping, restaurants, hiking trails, mountain bike trails, lake, spa, and Zip lining. The best part about this home is its’ location! From here you have ultimate Gallatin River access to some of the best fly fishing in America! You’re also just a short drive away from the town center and Big Sky Resort that has tons of fantastic shops, restaurants, and bars. Yellowstone National Park is a 50-minute drive away too, so there’s always something new to explore! David Moore was great to work with, promptly answered questions, filled in details both on the house and the surrounding area, took some extra photos for us, checked the house ahead, turned heat and lights on for us before we arrived after dark and checked on us while we were there. Sarah was also very friendly and helpful in providing information and assisting with the necessary paperwork. A great location right on the Gallatin yet close to Big Sky; well-situated between Bozeman and Yellowstone. Warm with character! Amazing! The entire stay was wonderful. Caroline and her staff were helpful and informative. The beds were so comfortable. To wake up with the water in your view was exilarating. Thanks to all! !